National has admitted it may have told the mining industry it intended pursuing mining as an economic development policy two years before the 2008 election. Prime Minister John Key this week said National did not campaign on its plans to look at mineral wealth locked up in the conservation estate at the last election because it didn't have enough information at the time to make the call. However, Minerals Association chief executive Doug Gordon says the industry's representations to National - based on the data which underpins the Schedule Four Stocktake released last week - received an encouraging response as early as 2006. 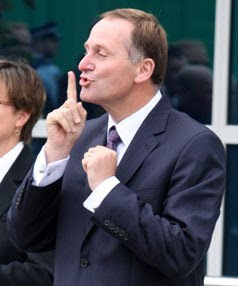 So while John Key did not tell the people of NZ that he intended to mine conservation land, he did tell the mining industry what they were planning as far back as 2006.